Diagnosis, Management & Prevention of Infectious Diseases. Objective: Diagnosis, Management & Prevention of Infectious Diseases. Kindly download Program Schedule for more details. MMC CME credits applied for. For immediate confirmation pay online. For International payments and registration: Kindly email us at events.hindujahospital@gmail.com to know further details/ queries. We accept local cheques only. Registration fee includes prevalent service tax. Delegates will have to arrange for their own accommodation. 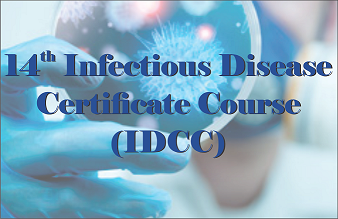 Please mail Case Presentation: 14th Infectious Disease Certificate Course 2017 on below email id: drayeshasunavala@gmail.com / ayeshasunavala@gmail.com by 31st August 2017.